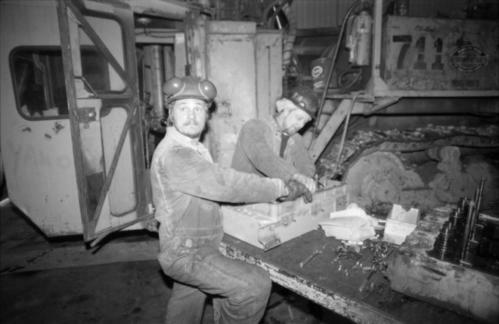 Photograph depicts two unidentified men wearing coveralls, hard hats, and headphones, while working at table in garage. Blasthole drill stands behind them in background. Item is part of the Cassiar Asbestos Corporation Ltd. fonds. Image is one of 72; descriptions available for items 2000.1.1.3.19.180 - 2000.1.1.3.19.226. See also item 2000.1.1.3.19.190 for image featuring similar content.